Today I revisited for the first time a few of the temples that I first visited last spring (as seen in “An Amazing Day of Photography at Some Eastern-Kyoto Temples” and "Revisiting April's Eastern-Kyoto Temple Stroll, among others), spending most of the time wandering the sprawling grounds of the Imakumano Kannonji Temple (今熊野観音寺). It was almost completely deserted except for light tourist traffic in the main area. Those who ventured 30 seconds beyond were treated to the most amazing single tree I've ever seen, the red one seen above. It was a dull, heavily-overcast day, and there were no electronic lights around, but the red leaves glowed with a pure laser red beyond anything I could have imagined, so much so that I wondered whether it was fake. 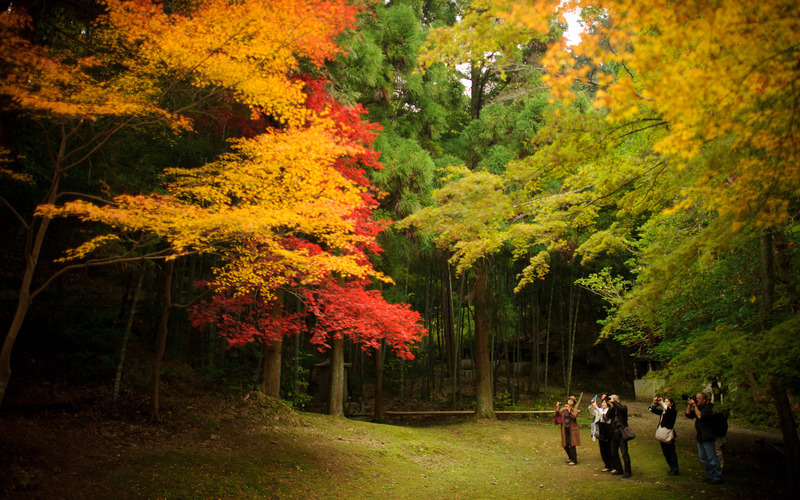 Kyoto treats me to jaw-dropping awe-inspiring displays of autumnal colors year after year, but it can still knock my socks off with something new. Of course, there's no way a digital camera can capture that deep, rich, pure red, especially not when shoving all the color data into something as feeble as the Internet-standard sRGB color space, so it's simply not possible to recreate the color on screen; you'll have to use your imagination. Beautiful – alas, there are few leaves left on Scottish trees now. I’m really enjoying these autumnal images, looking forward to seeing more soon! Cheers Jeffrey – take it easy and don’t over work yourself!! I thought I’d add how much we enjoy your blog. My wife lived in Kyoto, teaching English, and one of our friends here is from Kyoto. Your photos bring back many happy memories for them, and I am so looking forward to visiting with them in the future.